Lifestyling all the way home. It’s been awhile, but it’s time to continue the Virtual Home Tour. Here’s a look at before and after shots of our guest room plus some text about some things. Enjoy! I love our guest room because it’s actually very spacious, has a gigantic closet, and is the one room in our house that gets a lot of sunlight. We decided on green stripes because a) It’s gender neutral (we’re optimistic about starting a family and making this into a nursery one day, so…), and b) Why not? It’s so fun. Here we have the guest bed that Husband built. We can’t claim the idea for this. I love looking through home decor blogs and pictures – this bed was inspired from this post. I love this window sill. It gets a lot of indirect sunlight throughout the day. We also make it our makeshift greenhouse. Most of our plants thrive when we place them here. I’ve taken to rotating the plants in and out of this room. But one of the recent things we’ve added is this little herb garden attached to the wall. Here’s the door. Only two of our walls are painted in stripes. 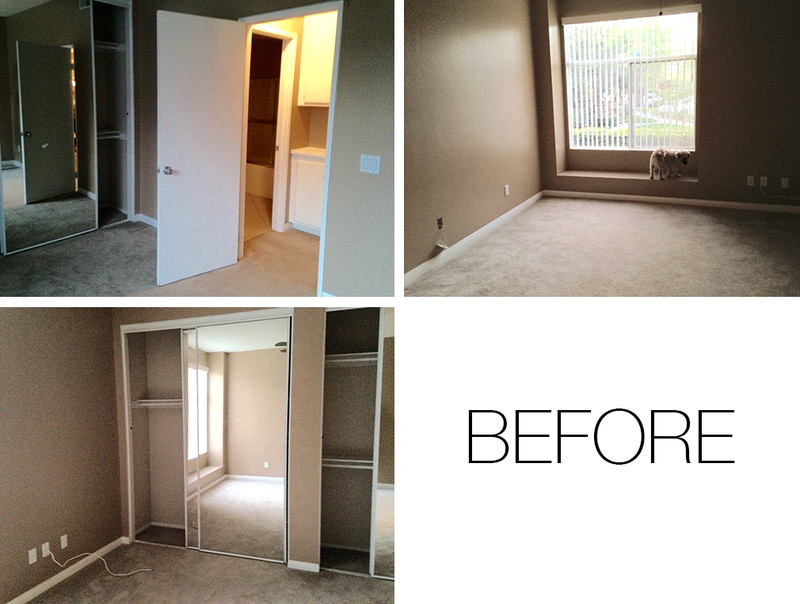 The third wall of this room consists of one giant closet. The mirrors also make this space that much bigger which is why I love this room so much. We’ve christened the guest room as our creativity room. Husband will normally work in here during the day. We store our art and crafts items in here. I didn’t really do a close up shot of our bar cart, but it’s the blue cart from IKEA which I use to store all my sewing supplies. The yellow chest in this room (also from IKEA) is meant to be an entertainment center but we use it to display plants and artwork, and in the drawers we store canvases, paint brushes, paint, etc. Amateur writer and professional rambler. Fiercely blogging from our tiny home in Southern California.